This is a large backpack with a capacious inner compartment and a lot of additional pockets. It boasts smart organization and even has a special pocket for an umbrella. Side pockets are a bit small and tight. The AmazonBasics NC1306167R1 is a durable backpack that you can use in any weather. Since it features plenty of pockets for small stuff and ample room for books and lunch boxes, this bag is great for a daily use. 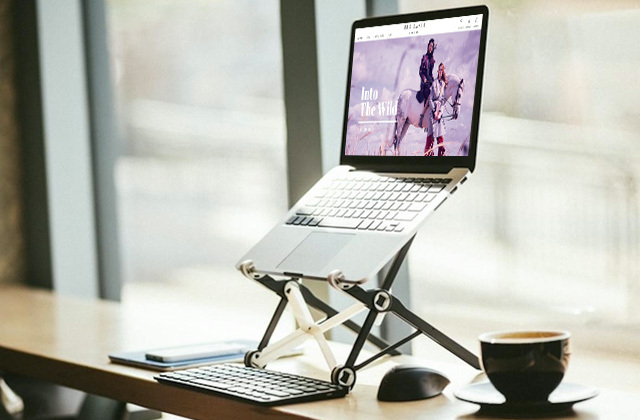 The backpack features a CaseBase stabilizing platform, so it can stand upright by itself and doesn't fall over. This way, your valuables will always be in place. Whether you need a bag for commuting to work or travelling abroad, this backpack will come in handy. 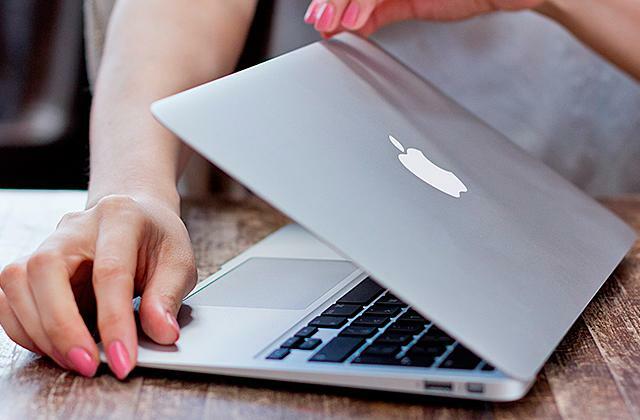 Durable and spacious, it can provide superior protection to your laptop and other gear. A scratch-resistant pocket at the top is great for sunglasses or touch screen mobile phones. Innovative strap management system keeps excess strap material out of your way. The backpack is too wide. 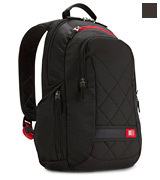 The Case Logic DLBP-114 is a functional bag that is stylishly black with red trim. It's ideal for use in the city, for going to school or work, or just for everyday life. 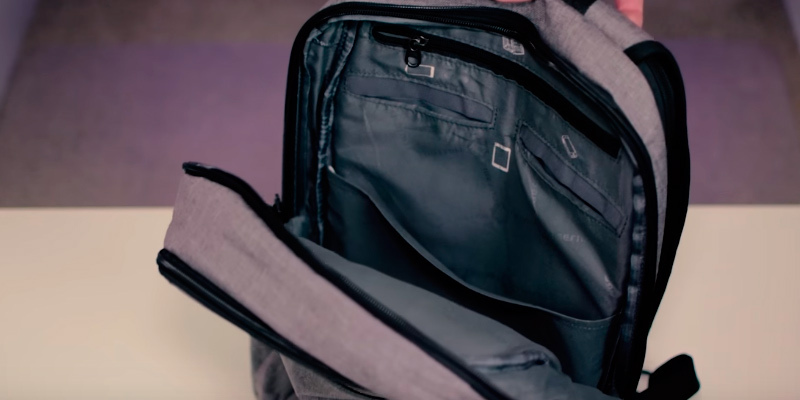 The bag has a dual-access zipper with anti-thief design on the main pocket. Plus, a laptop section is under the straps, which is also a very nice security touch. The shoulder straps could be more padded. The Slotra Business lightweight backpack is slim and compact, so it won't take too much space when you're in crowded tube trains. It's available in 4 different colours to suit your style best. The package includes a combination lock which can be locked into the metal ring (on the outside of the bag) for extra protection of the contents. The backpack is slightly on the tall side. 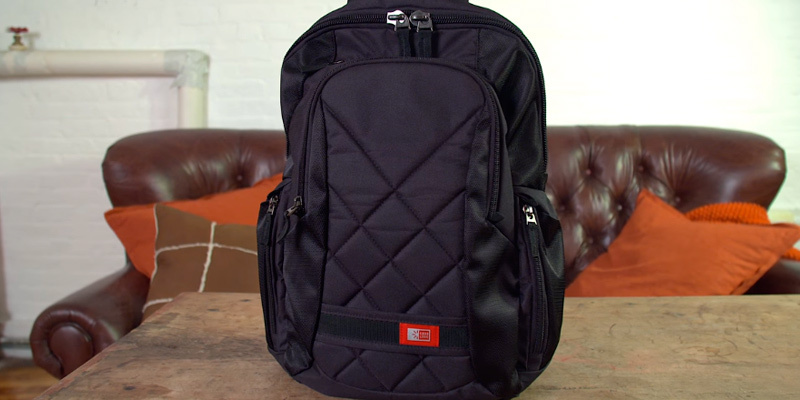 With 15 organization pockets, this unisex backpack offers the best work/life balance. It is a nice choice for active people, serious travellers, and professional photographers alike. 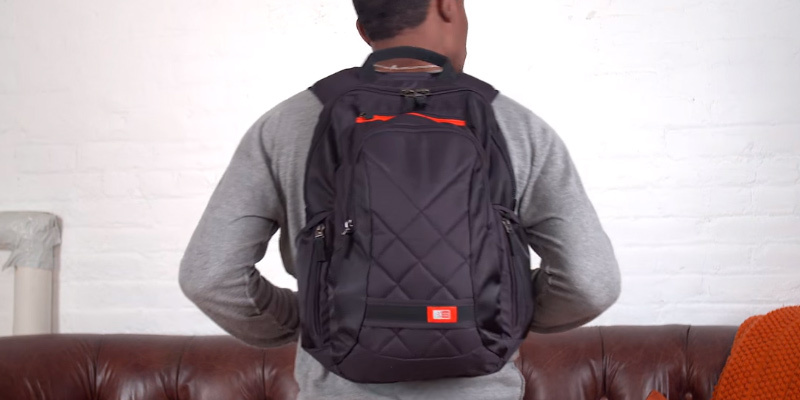 Meet this amazing backpack from the well-known shopping giant, Amazon. 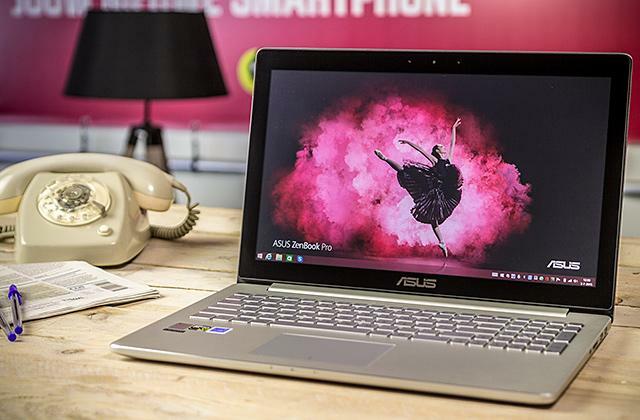 It's extremely capacious and suitable for laptops with screens up to 17". The bag is durable enough to withstand all rigours of everyday commute. 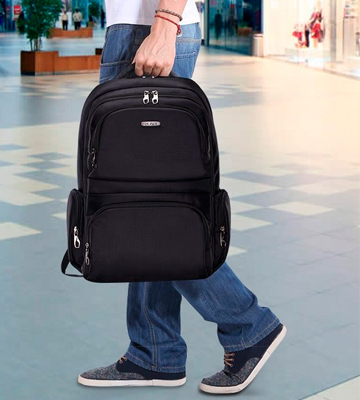 Thus, it's an ideal choice for active people who need to carry a variety of items to/from work. 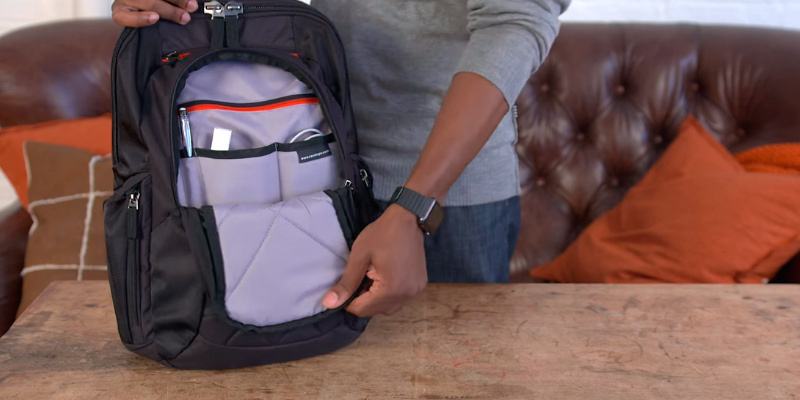 With an incredible number of different compartments, the backpack can hold your laptop and tablet, mouse, cables, lots of various papers and A4 files, books, drinks, snacks, and even gym stuff. This laptop rucksack is burly and sturdy. 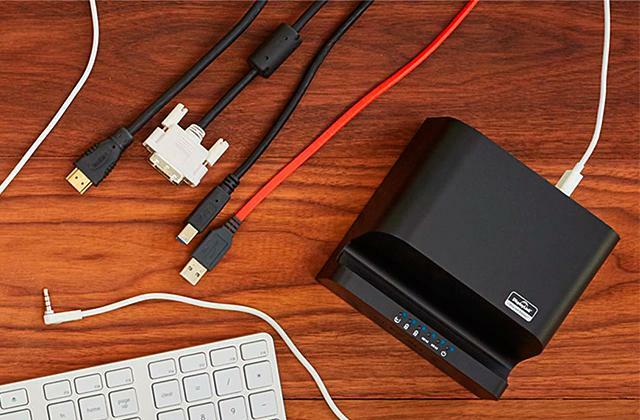 It will protect your laptop and other personal belongings not only from fall, shock and any other mechanical impact but also from rain and snow. Thanks to an additional layer of fabric over the zippers, the water has no chance to leak in. 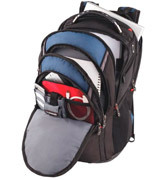 The backpack offers a great combination of protection, organization, and comfort. Made of breathable mesh material, shock-absorbing adjustable straps will not graze your shoulders. The back of the bag also has well-ventilated supportive padding, so you won't feel any fatigue and discomfort even on hot days. You can adjust the size of the backpack depending on how full it is with special side straps. The cushioned shoulder straps distribute weight evenly, making the backpack comfortable to wear no matter how full it is. 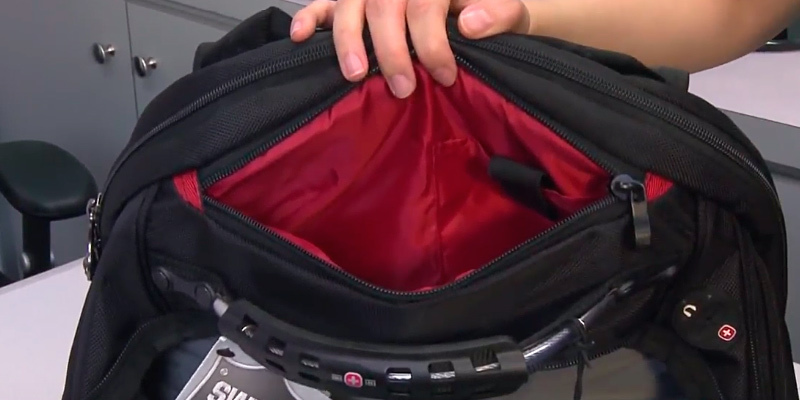 The left strap features a quick-access mesh compartment for phones and other small stuff. Perfect for those people who are always on the go! 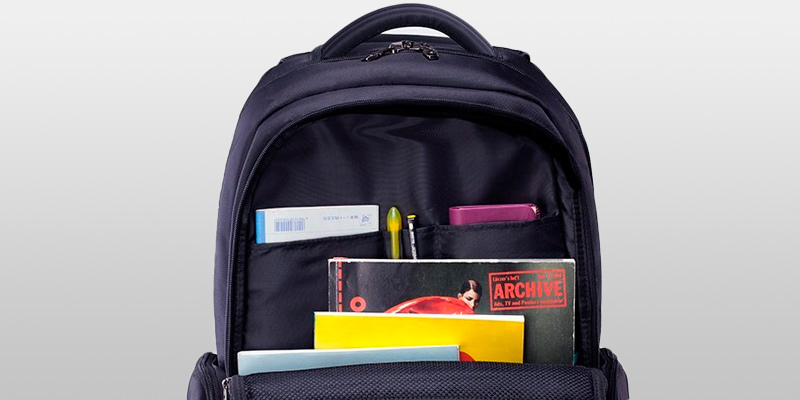 The AmazonBasics backpack is designed in a dark colour with orange stitching. The backpack is made in functional urban style with sporty elements, thus, it will be a good choice for young people, students, and schoolchildren. It has a large interior compartment with multiple organization pockets and a separate section for laptops. Also, the bag features a side cinch-latch system allowing you to make the depth greater or smaller. This backpack even has a special inner compartment for an umbrella and an exterior top pocket for all those bits and bobs you're always struggling to find in large compartments. 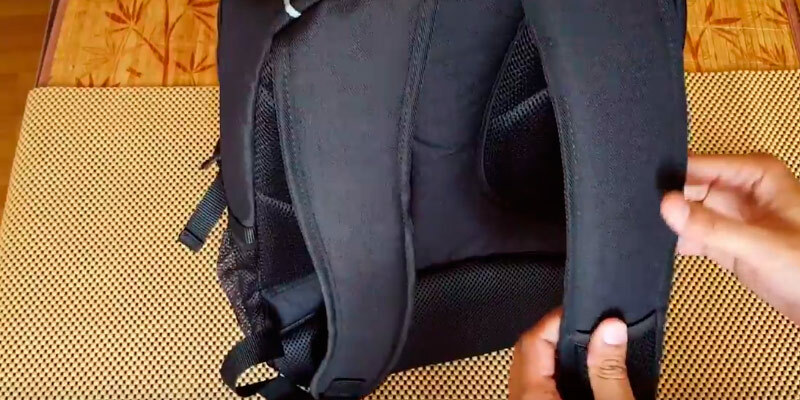 The backpack has two side mesh pockets for water bottles. Get a pair of sports water bottles and always stay hydrated on the go. Reliability, top quality, and smart features! 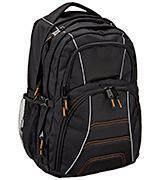 That's all about the Wenger 600638 IBEX 17" backpack. 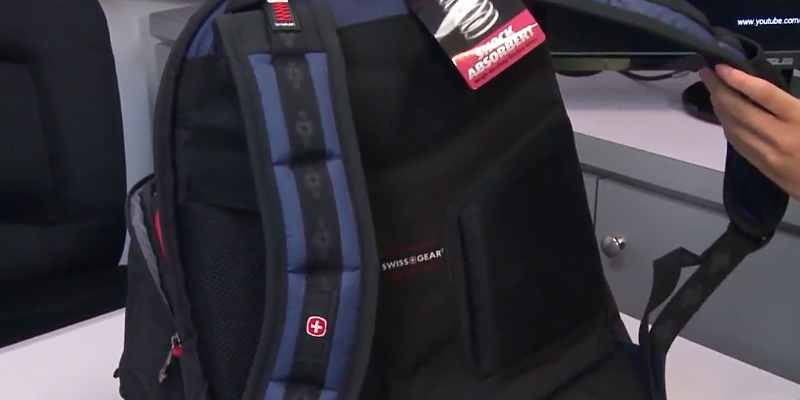 As you would expect from Swissgear, the bag is very strong and well-made. It's manufactured from a tough material that won't rip or puncture. All small details such as zips, seams, and stitching are all made to hold up well to the abuse of tough travel conditions. Therefore, this hardwearing rucksack is nice for city use and spectacular weekend adventures alike. Equipped with a thick-padded back panel and shock-absorbing shoulder straps, it distributes load evenly. Plus, the back panel has air-flow channels to keep your body temperature down, thus, you can spend all day bouncing from place to place without feeling discomfort. 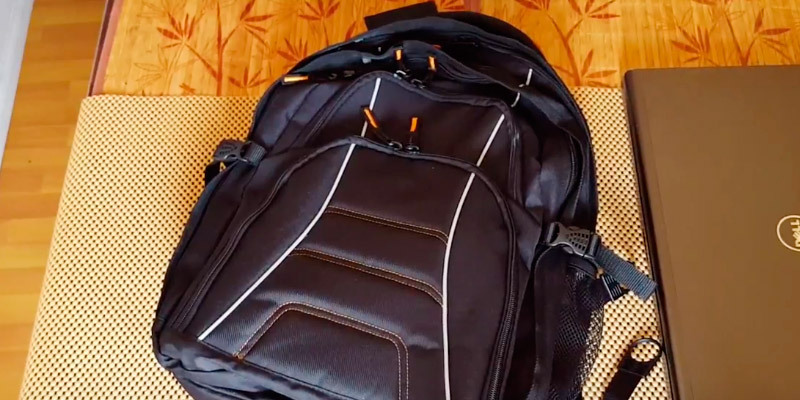 One of the best laptop backpacks for travelling! This fantastic rucksack is incredibly capacious and has lots of pockets allowing you to organize all your stuff neatly. It's not just an electronics carrier, it can double as an overnight bag and hold everything you might need for a short business trip. With 3 large main compartments, you will be able to pack in a pair of jeans, a sweater, underclothes, pyjamas, toiletries, and other travel necessities. For the maximum packing versatility, the bag features a CaseBase Stabilizing Platform (perfect for bulky items) and stands up on its own. A special Comp-u-Flex computer pocket will provide excellent protection to your laptop (up to 17"), while plenty of other inner compartments can securely keep power cables, keys, credit cards and various knick-knacks. The Quik access pocket on the top can hold your passport, wallet, or iPod/MP3 player within easy reach. 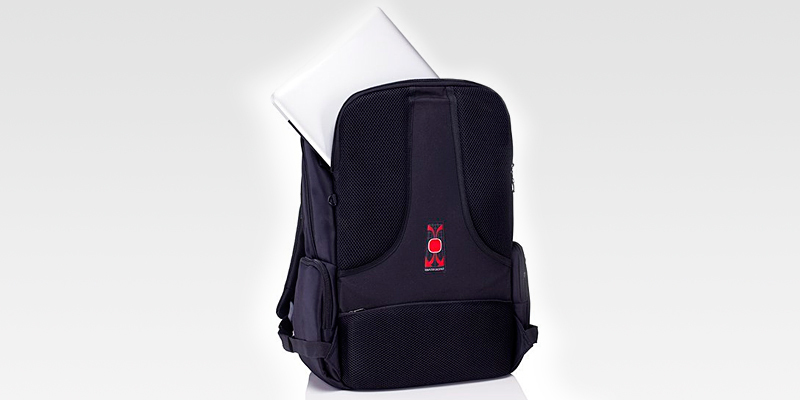 This Swissgear laptop backpack boasts a rigid panel that provides superior protection to your gadgets. 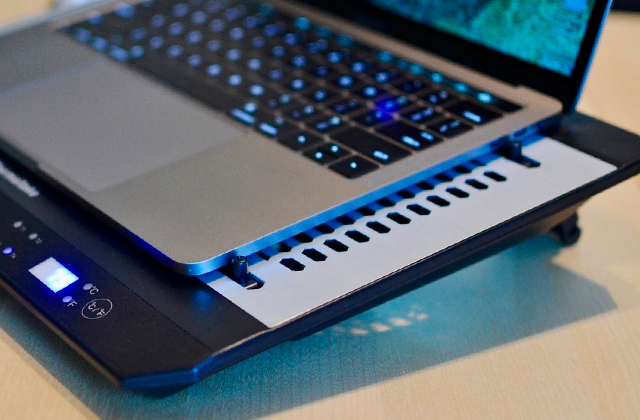 The panel is made from three layers of shock-absorbing foam that will keep your notebook safe even if bumped or dropped. To make commuting more fun, just put an MP3 player into a Quik pocket and enjoy your favourite music on the go. 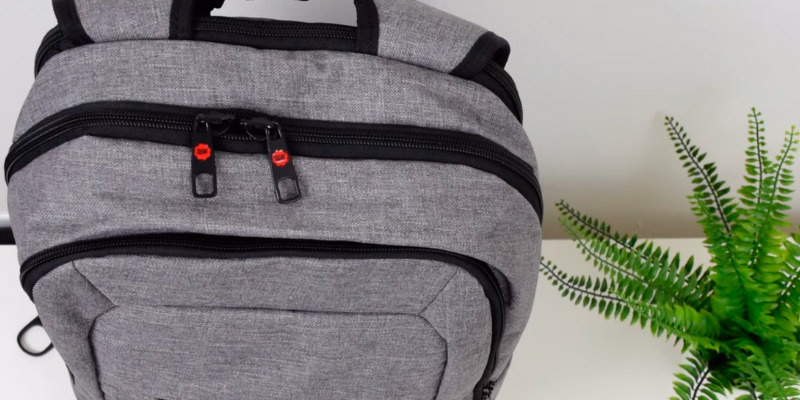 If you're looking for a slim laptop bag that won't slim your wallet, the Case Logic backpack is the one. For less than £30, you get a sleek, light, and comfortable casual backpack ideal for a daily use. Thanks to a soft padded sleeve for a computer, your gadget will always be safe within a mess of books, pens, snacks, and other stuff. 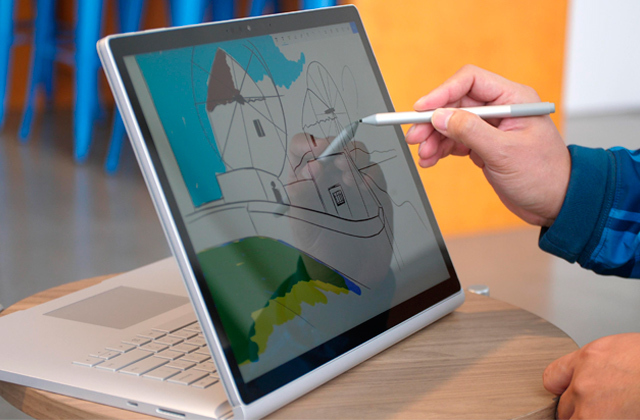 It can easily fit a notebook, cables, phone, documents, few books, chargers, as well as other little bits and still look very slim. Such design makes it an excellent choice for a crowded tube. Also, this small backpack is good for bikers who need something capacious yet streamlined for fast riding. Travellers will be able to load not only a MacBook and small accessories but also a night's worth of clothes for a day trip. With plenty of zippered pockets, this stylish laptop backpack can fit a whole bunch of accessories and daily essentials. In the main compartment, you can carry your laptop with a charging cable, an A4 folder full of papers, a pencil case, a notebook and a cosmetic bag, for example. The inner middle compartment is great for a tablet, while the front pocket is roomy enough for your purse, keys, pens, and other small items. And the top felt-like pocket is perfect for keeping your glasses or smartphone scratch-free. The side pockets are a nice touch. They allow you to keep your iPod, snacks, or keys always handy. The zippers open towards the bottom, so you can easily reach these pockets with both straps over your shoulders. The straps are quite broad and spread the load evenly over your back and shoulders. And thanks to an innovative strap management system, the excess strap material won't roll up and irritate you. 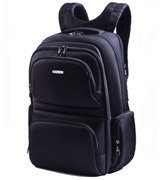 The manufacturer offers this fantastic backpack in different design options. You can choose a black, dark grey, or grey backpack. 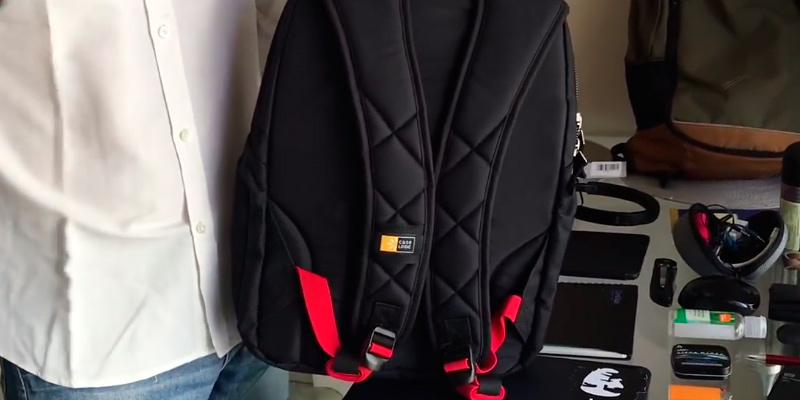 The black and dark grey models come with a stylish red detailing (trim and straps), while the grey backpack is made in classic style and is completely grey. The bag is available with a sleeve for 14", 15.6", and 16" laptops and tablets. Isn't it a good idea to fuel yourself on the go? The best way to do so is to eat a protein bar. Enriched with vitamins and minerals, it can boost your energy for a whole day. Do you commute to work by crowded underground? How secure do you feel? 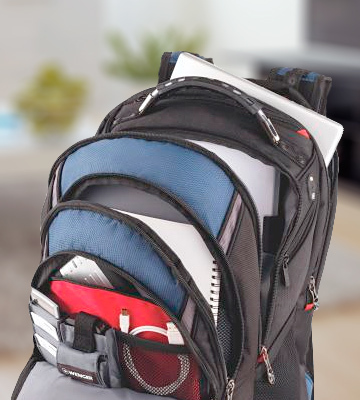 If you worry about the safety of your belongings, the Slotra ergonomic laptop backpack is a solution. It offers decent protection to all your valuables. The thing is that its main pocket has a patented dual-access zipper (a padlock isn't included). Plus, the laptop compartment is under shoulder straps, so nobody can steal your laptop and valuables while you're wearing the rucksack. 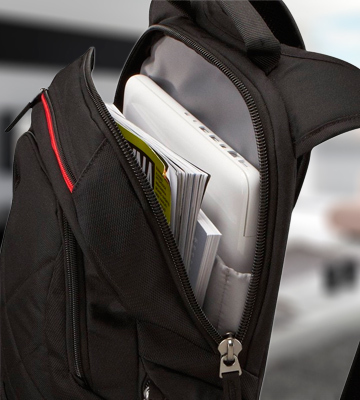 Still, this Slotra Anti-theft backpack is not only safe but also very smart-looking. It's pretty slim, sturdy, and well-made. The manufacturer has used high-quality nylon for its production. This material is durable and water-resistant. So, even when it rains, the inner compartments and all your contents will stay dry. Weighing less than 1 kg, this bag offers an impressive 23 L volume and an awesome combination of compartments. Unless it's completely full, it stays super slim and light, meaning it's a perfect option for office, school, and weekend getaways. Fitted with mesh padded adjustable shoulder straps and soft back panel, it's so comfortable that you can hardly feel you're wearing it. The interior has ample room for a laptop and other small gadgets, chargers, notepads, A4 files, pens, lunch boxes, clothing, and more. The hidden dividers will prevent all that stuff from mixing up. The bag also features exterior side pockets for water bottles and an earphone hole for an easy access to your MP3 player. Nice addition, isn't it? Although the backpack is manufactured from water-resistant nylon fabric, we don't recommend you to use it in heavy rain. It can repel water in 5-10 minutes only. Keep away from using alkaline detergents when washing the backpack. Also, don't wash it with hot water. What Else to Pack in? Does it often happen that you need to plug several devices into USB ports, but your laptop hasn't enough free ports for them? A USB hub can solve this problem. Having one in your laptop bag, you'll be able to upload photos from your camera or charge your iPod anywhere, anytime. Designed with everyday requirements in mind, this amazing backpack can accommodate all needs of a daily commuter. 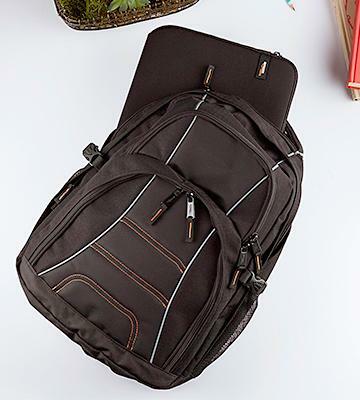 It's classy looking for office use yet it's backpacky enough to be extremely versatile. You can use it as a business/carry on/camera/laptop bag. Owing to the great security features, everything will be safe and secure inside the pack. It boasts Anti-theft dual zippers that are hard to be poked by a knife and a neat combination lock which can secure 2 zips together for extra protection. Made of high-quality water-repellent nylon, the backpack holds up rain, snow, and other liquids. The fabric is super strong and robust, while all the zips are very smooth in operation. The bag is thick enough to keep its shape even when all compartments are unzipped. This knapsack has a stylish, charcoal black design with attractive woven texture and silver metal Polaris logo. The rucksack is very comfortable to wear and carry due to the padded handle and adjustable shoulder straps. It hangs well on your back, plus the rear part is also cushioned for superior comfort. Three padded areas on the back are made of an open-mesh material to let the air circulate. This backpack is really comfortable, even when fully loaded. Furnished with as many as 15 pockets, this amazing backpack will definitely solve all your storage needs. 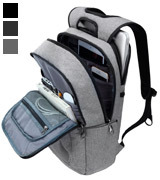 The horizontal zipped compartment on the rear of the backpack is useful for storing a laptop power supply. Behind that compartment, you'll find a half-length zipped pocket with a handy keyring. Next, you'll notice a larger section with an inner zipped mesh pocket and two nylon pouches for small accessories. Behind this section, there is a full-length compartment with an inside zipped pocket and three pouches. The largest of the pouches is great for storing a tablet. Small zipped pockets lie on each side of the backpack. They are perfect for a mouse and small computer equipment. Both these pockets have a band for pens or a tablet stylus. 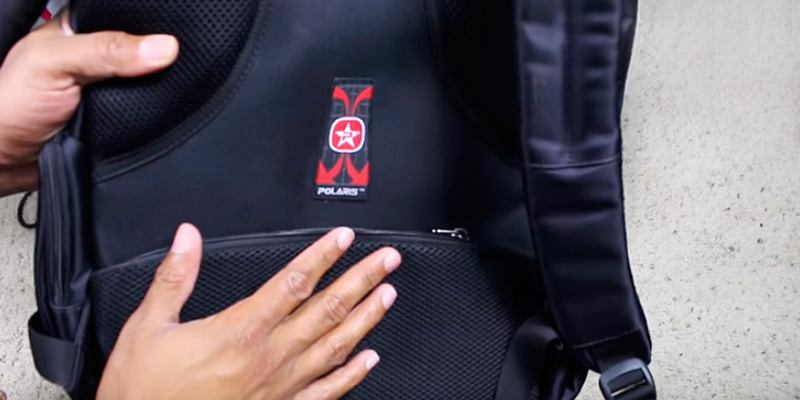 A hidden zipped and padded compartment for a computer is under shoulder straps. 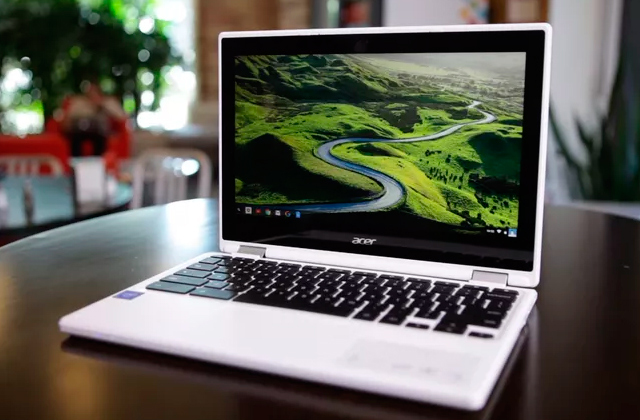 It can accommodate laptops up to 15.6”. The rear section also includes a horizontal zipped pocket for cables and other little knick knacks. 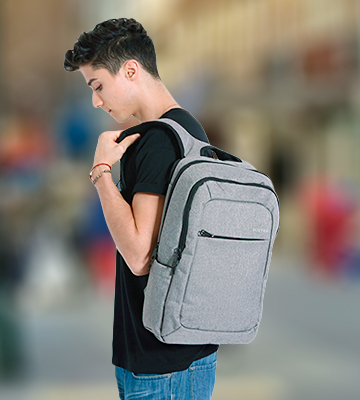 The manufacturer is so sure of the highest quality of this backpack that provides a 60-day risk-free and hassle-free guarantee on it. If you're not satisfied with this bag, you can simply return it within 60 days after purchase. Why not to give it a try? Tired after a long day? Suffer from stiffness and back pain? A good body massager is a solution. It can ease your pain and relieve muscle tension by providing you with a high-quality massage session in the comfort of your own home. 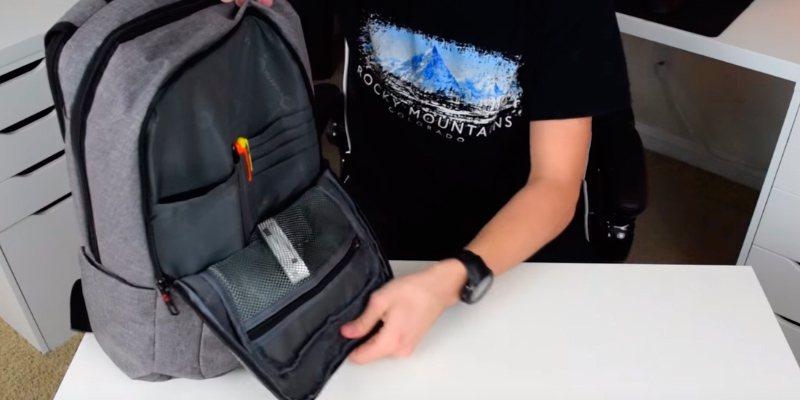 What Is a Laptop Backpack? 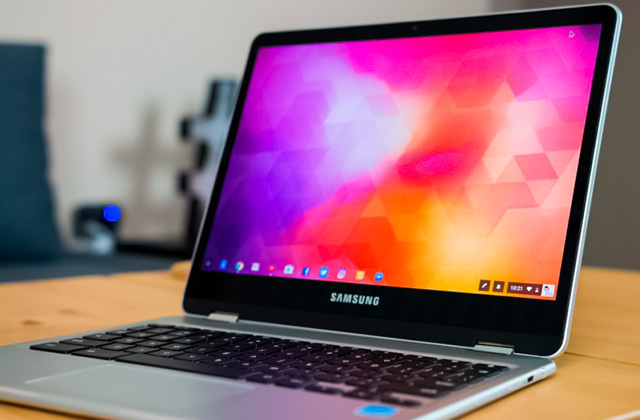 Most buyers say that ensuring protection and convenience of transportation of their laptops is almost as important as choosing a laptop itself. 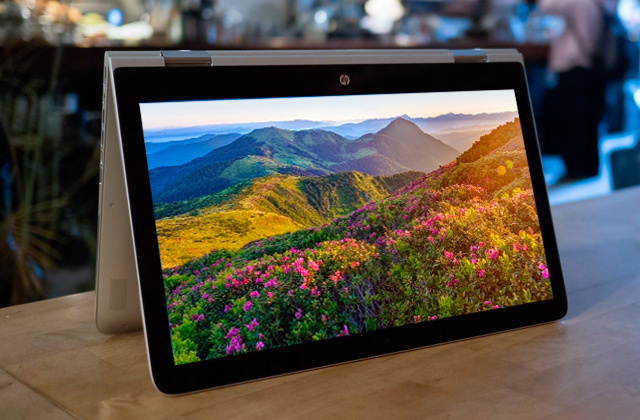 Be it a meeting in a coffee-house or a presentation, having your own laptop with you is a great benefit. 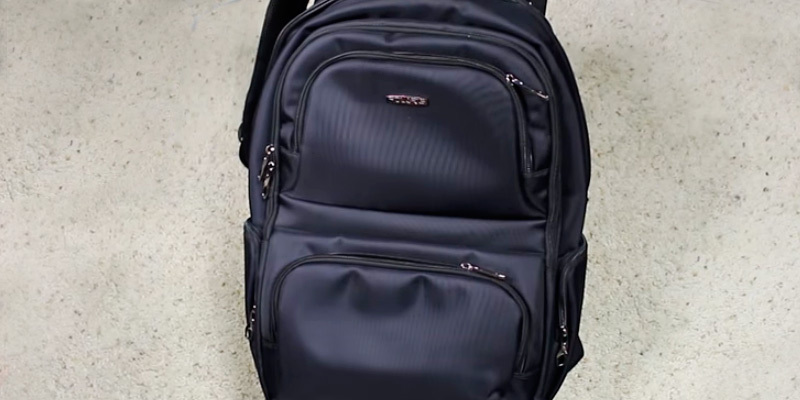 A laptop backpack may be useful for your travel and daily life. In addition to your laptop, all your documents, books, stationery, electronic devices and other necessary things can be put into a laptop bag. Some packs can fit even a night's worth of clothes and other travel necessities. 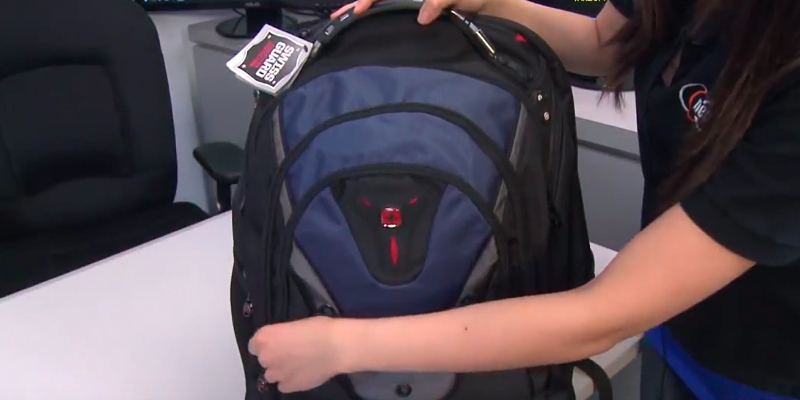 In this review, we cover the advantages of the best backpacks for laptops. Keep reading and make your choice. 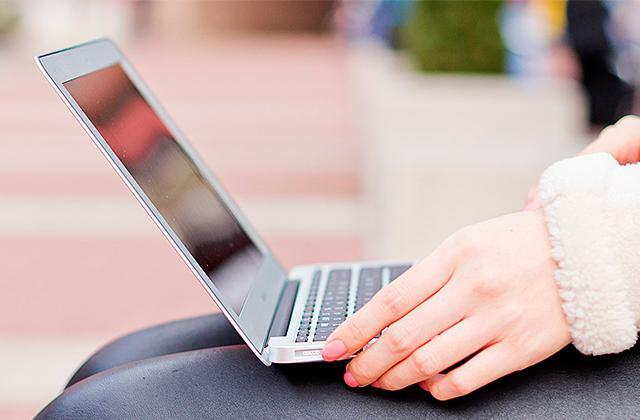 There are times when a backpack might seem too bulky to carry with you but you need your laptop anyway. The manufacturers saw this happen and now we have a great selection of laptop bags. 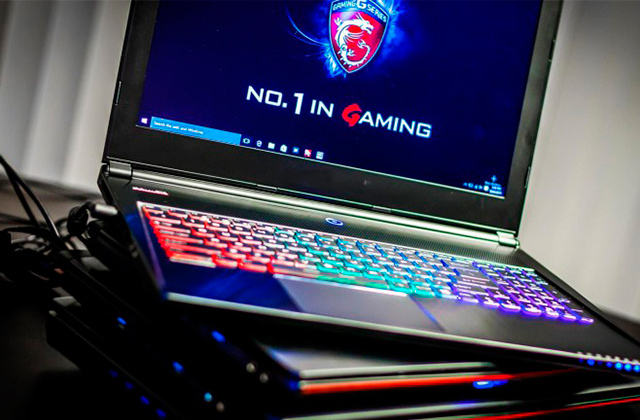 Our review will help you choose the right one for any device type. First, consider the Practicality of the chosen backpack to find the best model to fit your needs. The practicality depends on many important factors, and the main one is probably the size of the laptop case. Most backpacks are designed for laptops with 14" - 17" screen size. The second factor affecting the practicality of a laptop rucksack is a number of compartments for your personal belongings. 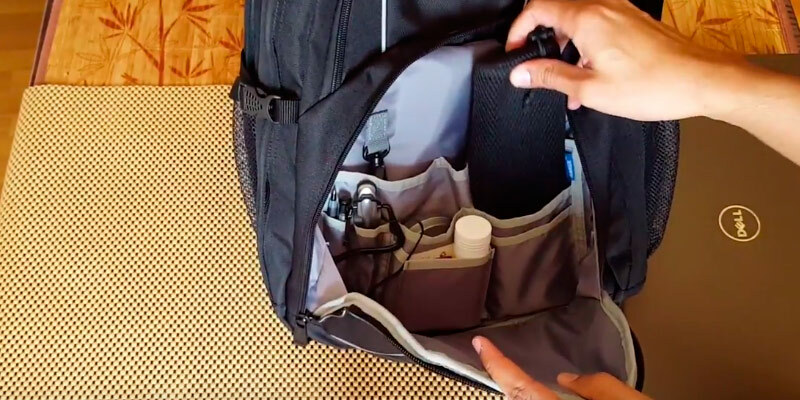 Each backpack model has its own number of compartments or pockets where you can store your laptop accessories, such as a power supply unit, a mouse or an external hard drive, as well as documents or stationery. Check if the laptop section has straps for better stability of the computer. The second important factor in choosing the very best laptop bag is Convenience. Pay attention to such important things as adjustable padded shoulder straps, a comfortable "breathable" orthopaedic back or special grips for transportation. For instance, a straight rigid back with anatomical inlays will help to avoid bumps and shocks. It’s also worth paying attention to technical solutions adopted by the manufacturer to ease the load when wearing. Also, consider the Protection your chosen backpack provides. If your laptop gets wet in the rain, all the advantages of a backpack will be worthless. Consequently, your laptop pack should be well protected from moisture. One of the important features an additional cover layer of fabric over the zipper. 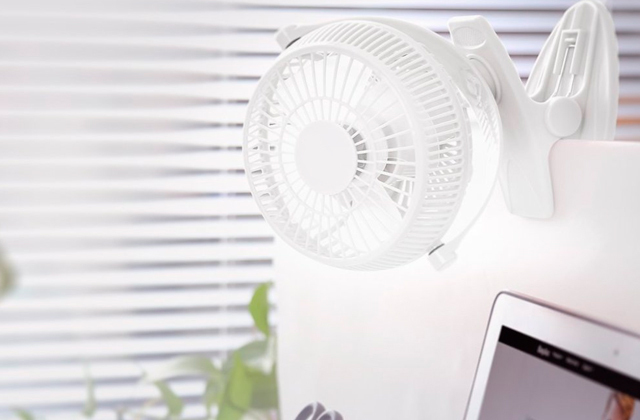 If there is one, your laptop will remain dry. 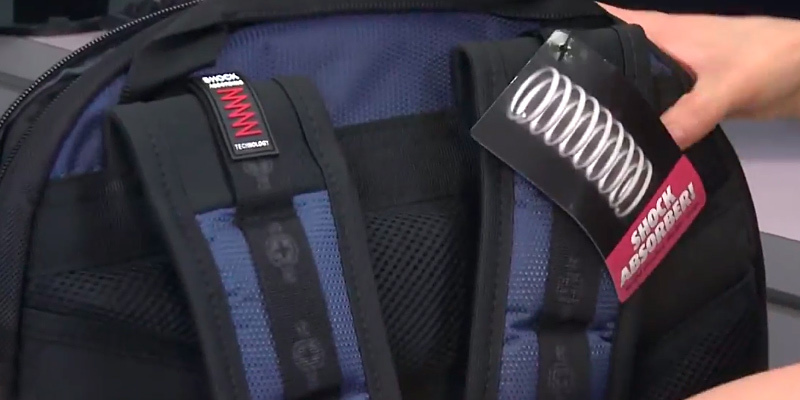 Protection options also include constructive solutions applied by a backpack manufacturer to enhance resistance to shocks or falls, which makes transportation safer. And of course, do not forget to pay attention to the Style of a backpack and find if it suits your personal style and matches your individuality. Think of what life situations it’s suitable for, whether travelling or daily use. 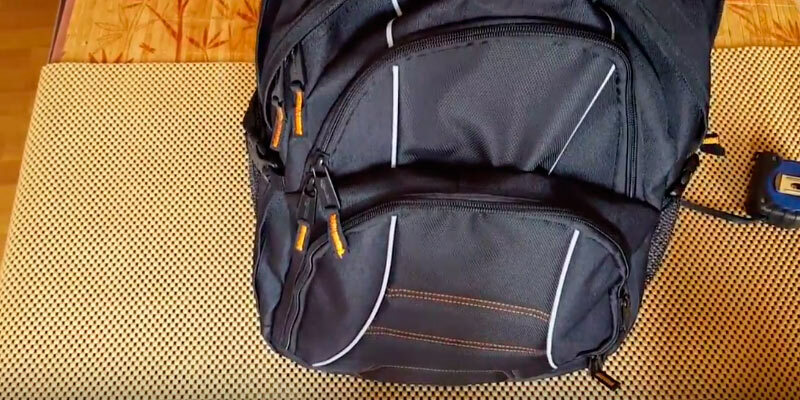 Q: How should I take care of my backpack? A: First of all, you should wipe your bag down regularly to minimise the build-up of dirt. If you backpack gets wet and isn't dried properly before use, this can lead to mould build up. So, it's better to keep water out. A great way to keep the rain off your pack is to get a special rucksack cover. To increase the life span of your bag, you can use a rucksack liner. This will help you reduce the risk of spillages. Of course, you shouldn't pack anything that might cause damage to your bag (knives and other sharp items). And even if your rucksack is made from ripstop fabrics, you shouldn't drag it over rough ground. Also, try to avoid brambles and thorn bushes. Q: Do airlines allow a laptop backpack as a personal item or carry on? Q: Can side mesh pockets handle standard 1-liter bottles? A: No. However, they can definitely fit 500ml bottles. If you wish, you can get a tall narrow cylindrical 1-liter bottle and put it in side pockets. Q: Can I wash a backpack in a washing machine? How? A: Most models are machine-washable. First of all, you need to empty the backpack fully. Check all compartments for small items that might be hidden. Also, check seams and corners for debris. You may even use a vacuum cleaner to remove clogged dirt. Leave all pockets unzipped. Then, make sure your bag has plenty of room to move in the drum of your washing machine. Put your rucksack in a laundry bag (if you have one). Use a small amount of gentle laundry detergent, but keep aware of using softeners as this can damage fabrics. Finally, run gentle cycle in cold water. After that, allow your backpack to dry naturally. Q: Can I carry extra gear in my bag besides my laptop? A: Of course, you can. The size of the bag will vary depending on its capacity. Typically, a laptop bag can fit a computer itself plus its power adapter and mouse. However, today the market is full of multi-purpose packs that are not limited to being just an electronics carrier. They can hold anything you need for a short trip. Q: Is a laptop bag exposed to the elements? 1. 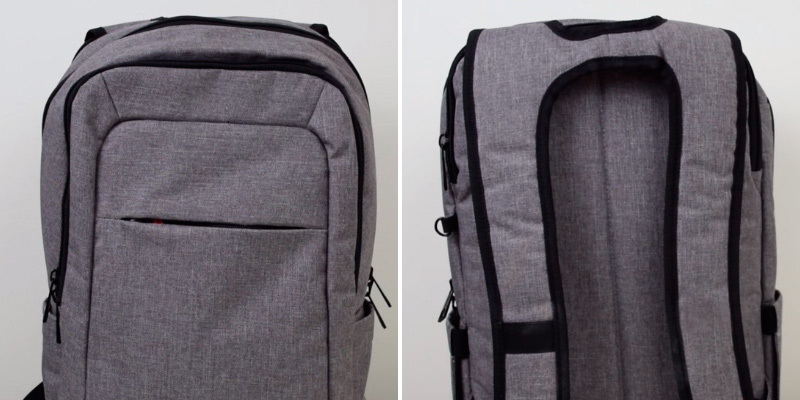 Laptop Backpack Buying Guide, eBay. April 27, 2014. 2. Jamie Carter How to choose a laptop bag, TechRadar. July 07, 2015. 3. How to Wash a Backpack, Mountain Warehouse. March 23, 2015. 4. Backpacks: Sizing and Fit, REI. 5. How to Clean a Backpack, REI.